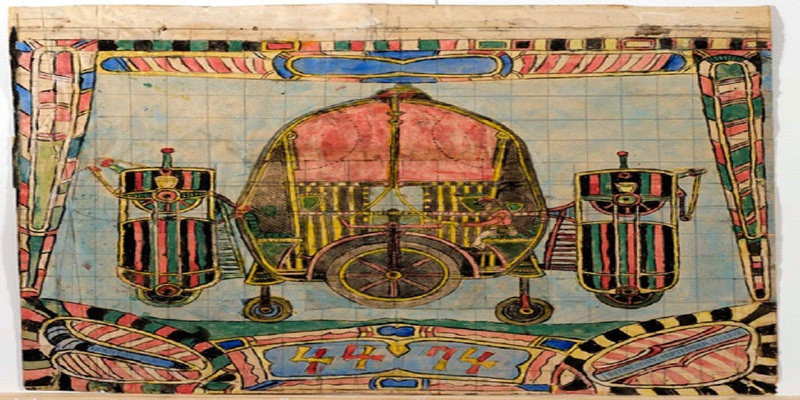 Between 1899 and 1922, Dellshau created 100 airship designs, and you can see a few more of them, along with Dellshau’s crudely bound notebooks and more details about Dellshau’s life and work at Messy Nessy Chic. Dellshau didn’t publish his creations, instead keeping them private in his notebooks alongside detailed “recollections” of what he called a secret society of airmen called the Sonora Aero Club. According to Dellshau’s notebooks, the dapper gents of the Sonora Aero Club attempted to build various flying machines during the 19th century, and his notes detail their various flights, crashes, and intrigues—long before the flight of the Wright Brothers. Some portions of the notebook are in an elaborate code, some of which has yet to be translated. 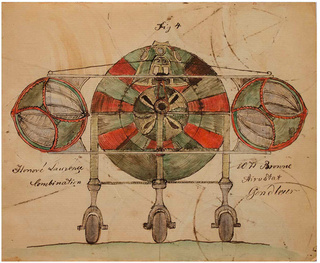 While Dellshau’s writings and illustrations seem to be works of aeronautical fiction, some aviation enthusiasts have speculated that there might be at least some fact in them. Pete Navarro, a graphic artist and UFO researcher, bought several of Dellshau’s notebooks and attempted to decode them, suggesting that there might be a link between the Sonora Aero Club and several alleged airship sightings in the US during the 19th century. He published his findings in the book The Secrets of Dellschau: The Sonora Aero Club & The Airships of The 1800s, a True Story. But aside from Dellshau’s writings, there is no evidence that the Sonora Aero club ever existed. If there truly was a secret society of airship builders in Dellshau’s past, it remains, for the most part, secret. Enter your email address to subscribe to SuperSci 9.2 and receive notifications of new posts by email. SuperSci 9.2 is licensed under a Creative Commons Attribution-NonCommercial-ShareAlike 3.0 Unported License.